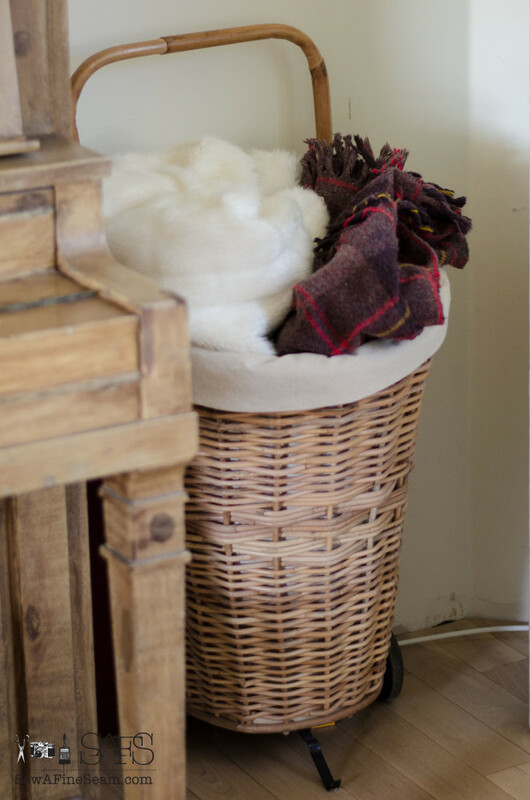 I love fluffing our home and the change of seasons provides the perfect reason to change out some decor and freshen things up! Joining up with blog friends for a Fall Home Tour 2015 kicked me in gear to get it done this year too! I had fun, buying a few pumpkins, a white mum, some broom corn, a decorative cabbage, and a tiny pumpkin decorated with miniature succulents. 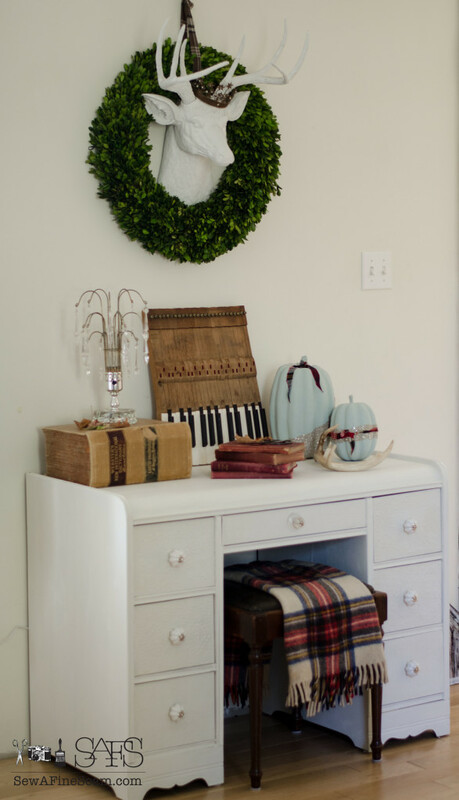 I’d already added some plaid for fall and painted and glittered a couple faux pumpkins. Now it was time to add some decor to the front porch and my urns, in the form of some real pumpkins and some leaves and sticks scavenged from the yard. My almost 10-year-old helped by gathering some pretty leaves. And by showing me where some bushes were that still had some red berries on them. This old wood toolbox is a recent find from a flea market. I have plans to fix it up and use it for storage in my work room but for now it makes a great base for some fall decor. 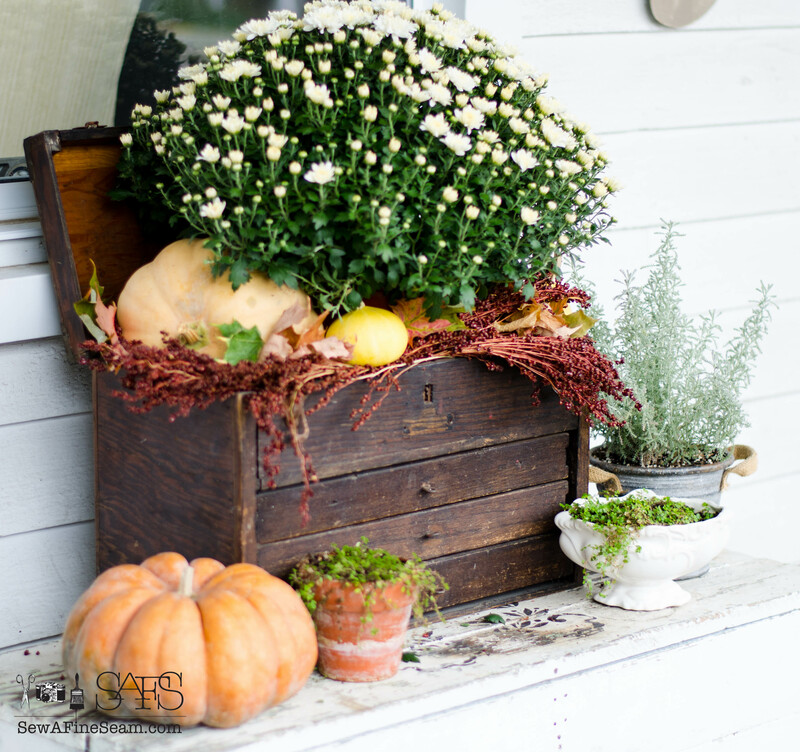 The potted white mum with pumpkins and gourds and leaves and a bit of broom corn created just the mix I wanted for a natural outdoor vignette for my porch. It was a chilly, windy day when I created this but it was still fun! Socks, shoes and a jean jacket kept me warm enough to enjoy the process! My metal ‘gather’ sign has been on our porch for a couple years now and I still love it. I leave it there year round and it’s just starting to show a bit of rust coming through the paint. I like the worn, rusty look so I will continue to let it weather and wear. The flowers in my urns at the front walk came back and bloomed again this fall so I simply plopped some pumpkins on top of the flowers, inside the metal orb. Most years the flowers are completely finished for the year and I pull them all out and add the pumpkins to the urns with a bit of burlap tucked under them. I’m loving the blooming flowers with the pumpkins this year – makes summer seem to have hung around just a bit longer. The green plants and the bluish herb in the metal pot are leftover from summer. The small gourds are from the volunteer plant that came up from the seeds of the gourds my daughter carved last year. She had fun watching them grow and harvesting them as they ripened. Inside the dining room you can see a few more natural elements I brought inside to spread the feeling of fall to the house. 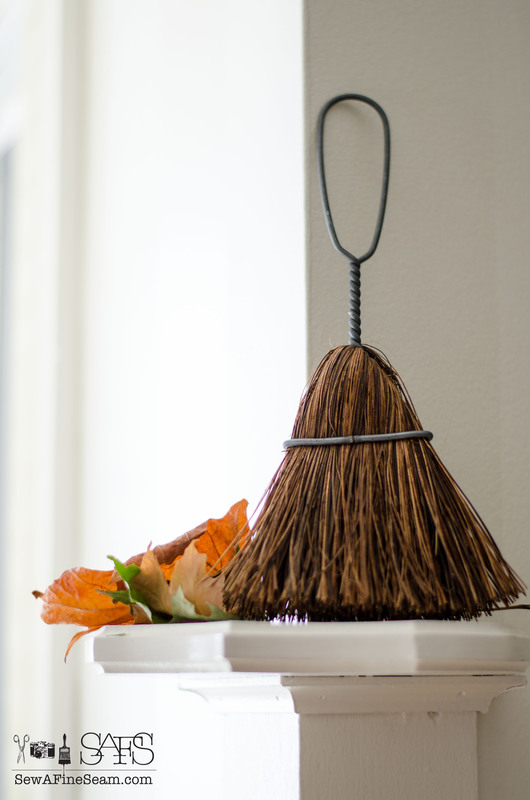 Broom grass and a small pumpkin detailed with succulents by the front door add to the feeling of fall the plaid created. 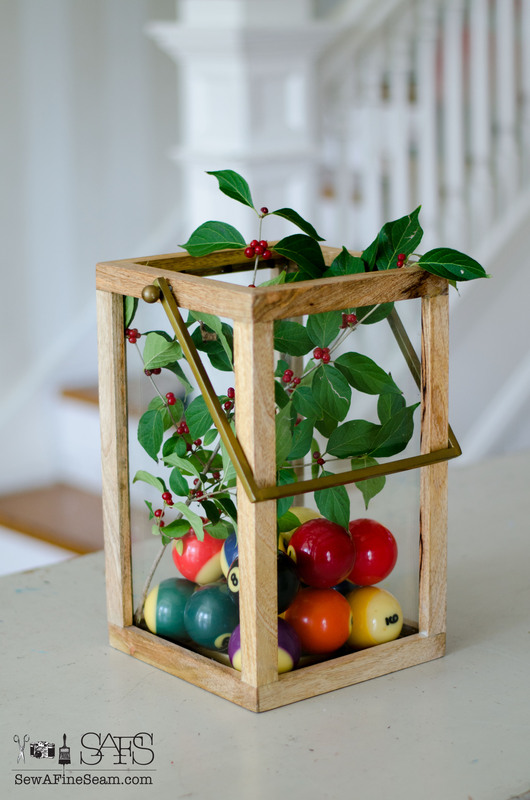 The vase holding the pool balls became a centerpiece for the dining room table and a branch of leaves and berries was added for a natural touch. The nook in the dining room got the ornamental cabbage plant I picked up when I got the pumpkins. A slice of a cedar log under the trophy cup holding the plant creates a very woodsy, autumn feel. The small shelves beside the nook got some leaves added to them. Leaves were added to the dresser vignette. The wood feather garland already had the bits of plaid added to it earlier. My new dining room light. 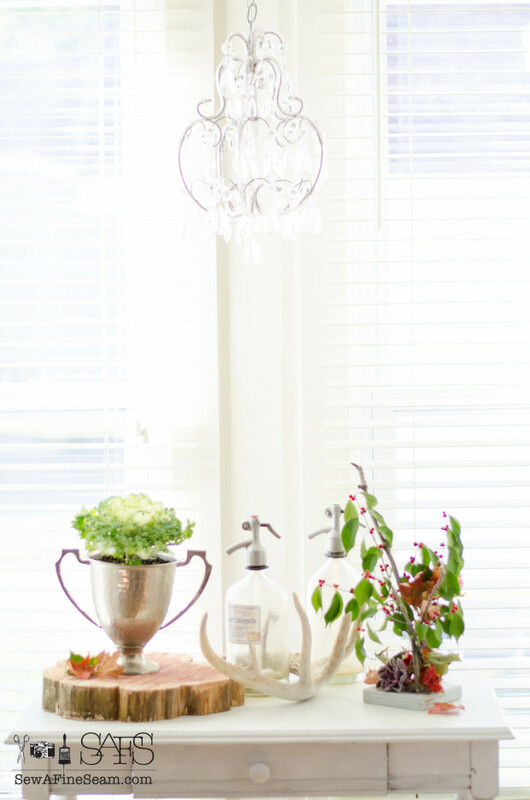 I am so in love with this vintage chandelier! I bought it from a friend who posted it on fb. Her parents were selling this one and another smaller one. I bought them both with plans to perhaps use them in my own little retail shop someday. But somehow I couldn’t just store them away for ‘someday’. And I couldn’t bring myself to put them up for resale either. So I asked my hubby if you could get LED candelabra lights. And he said yes. So I proceeded to carefully broach the subject of swapping out lights. We’d get a ton more light in the room with a lot less cost than the one 100watt bulb we had in the IKEA basket light we had in the room. My mild-mannered hubby never balked but got right at it and changed out the lights. We spend a ton of money on lightbulbs but these should last a LONG time and they cost next to nothing to run. And it gives out so much light my kids say it’s too bright. Not me. My eyes are aging right along with the rest of me and I need all the light I can get! Into the living room. Nothing really changed on the shelf but a few natural elements found their way into some other spaces of the living room and a few things were rearranged. David looked a bit short with the taller signs on the other side of the tv. So I asked my husband to cut me a wood stand for him. We’ve had an old cedar log lying along our fence for years. I’ve been wanting to do something with it for ages. Every time I ask and Travis pulls out his chainsaw to cut it for me the saw won’t work. It almost didn’t this time, but he persevered and got it working. I have a few of these log slices and several large log pieces now stored in our garden shed waiting for spring. I want to make them into side table log chunks like you see here and there. I finally have them cut to size and they will be ready to work with next spring! The desk area kept the plaid and the faux pumpkins. I added this cool piano art piece and some leaves. 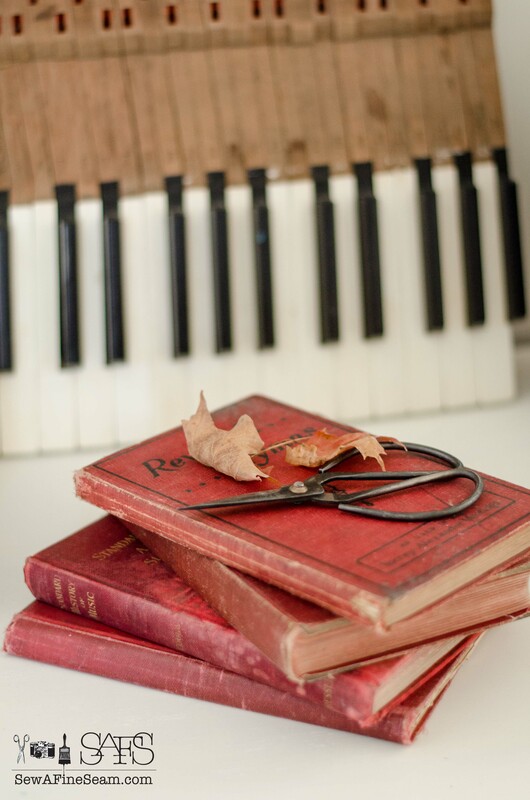 I like the vintage scissors for fall – lends to the idea of gathering – going out to cut the leaves, corn, etc. from garden. 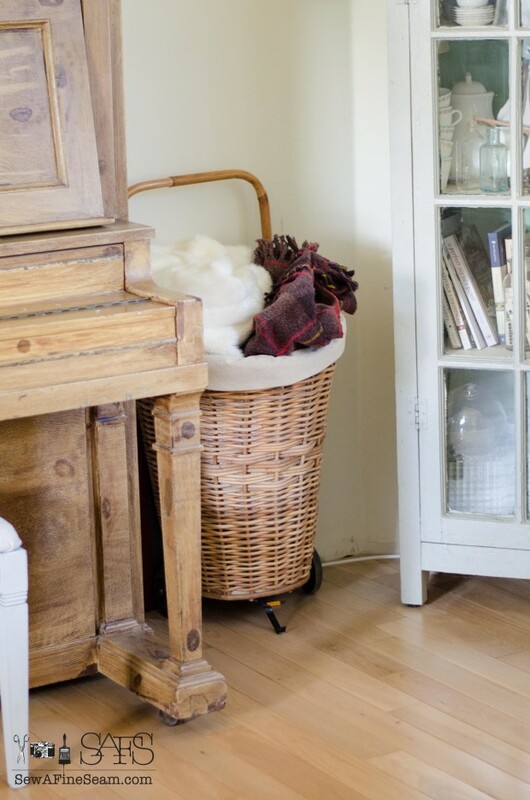 I tucked another fur blanket and a plaid one on top of some other blankets in this flea market basket in the corner between the piano and cupboard. Not sure what took me so long to decide to use this basket to hold the blankets. 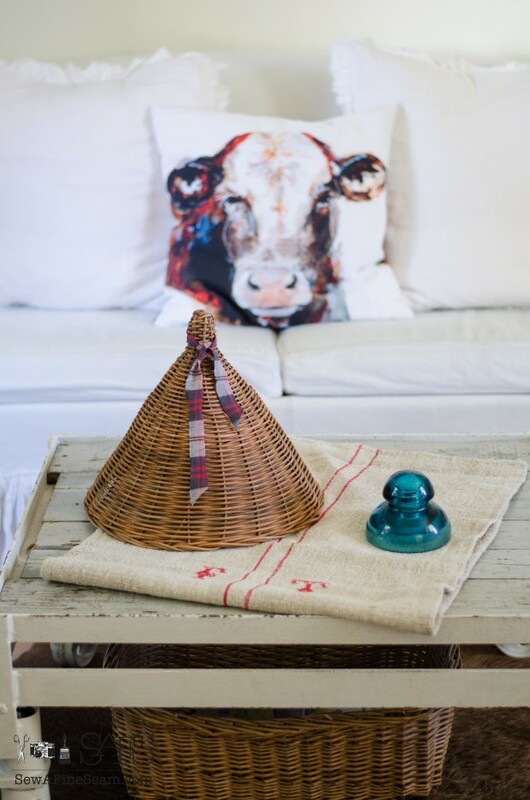 European grain sack added to the coffee table. Back in the dining room – a close up look at the vignette in the nook. 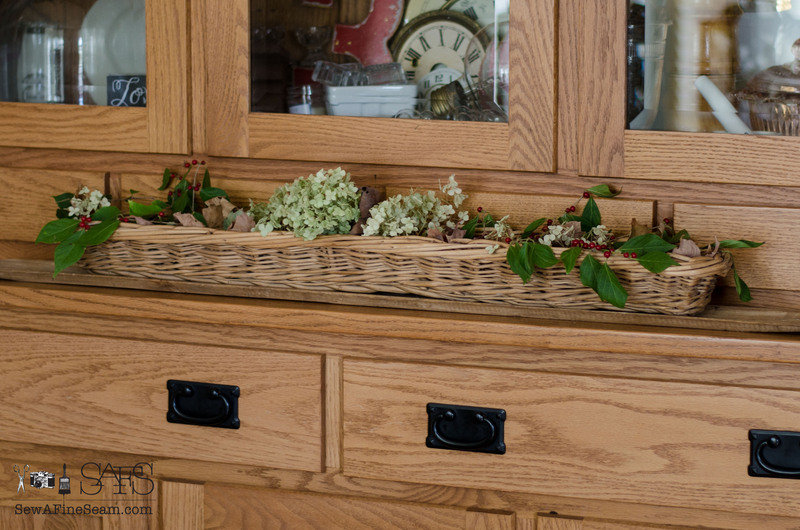 And a closer look at the basket of natural elements on the china cupboard. 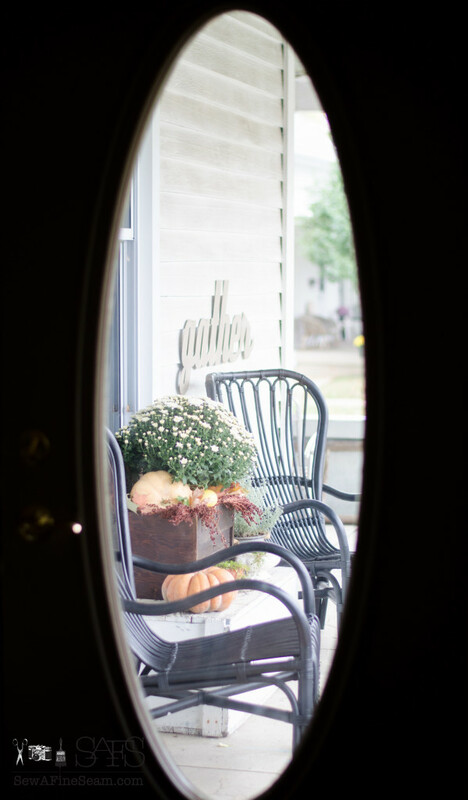 The kitchen porch got a bit more Fall decor too. The basket of sunburned hydrangea got moved there and some gourds added to the space. Hydrangea and broom grass were added to the vintage time card holder. I hope you enjoyed my little tour of my fall decor! Now you can hop on over and see what my friends have to share too! Gorgeous home. Love the way you decorated with nature. That’s right up my alley and the broom corn is something I haven’t seen and love. Your urn are so beautiful and I like that you left the blooming bacopa and topped them off with pumpkin. I’m so happy with how it all came together – thanks so much Patti for coming by! Your creativity always shines through. 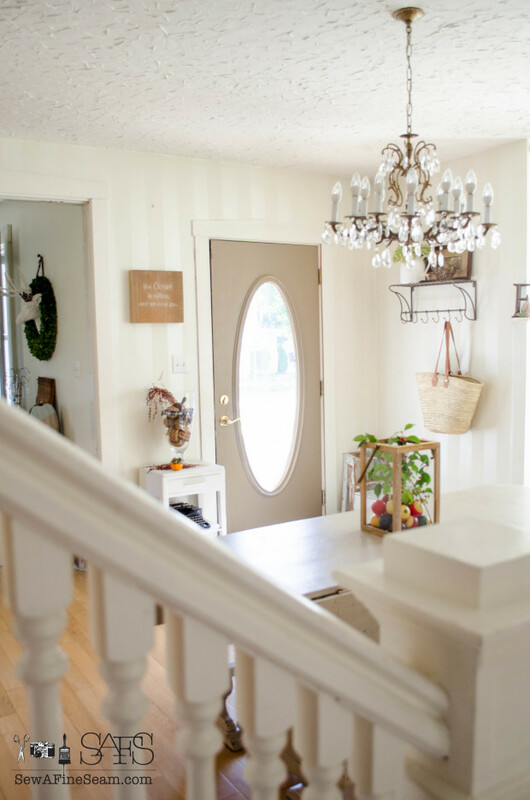 I love the front porch, the striped wall (is that new? ), and your dining room table is gorgeous. The items in nature always look great. It is just now getting a little cooler in the mornings. This weekend was pleasant. I hope it stays that way a loooonnng time. I love autumn, just not winter. I can’t even imagine your winter. The walls of my dining room are striped and have been for years. I painted them the first time with flat and gloss paint both in the same color. 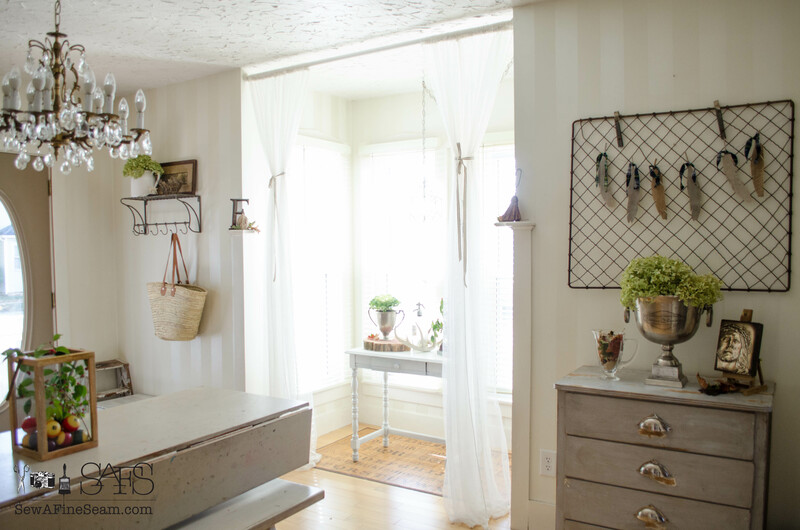 When we repainted a few years ago I used satin paint and then did the stripes with a faux paint glaze. Honestly the walls need painted again and I’m not sure I have the stamina to do the stripes again! Hi Jill, I had so much fun touring your home. 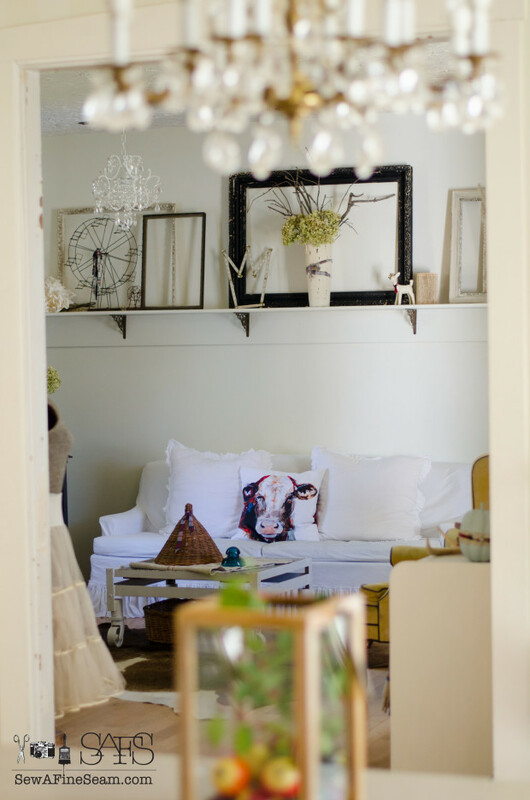 I love your creativity in how you displayed your vintage items. 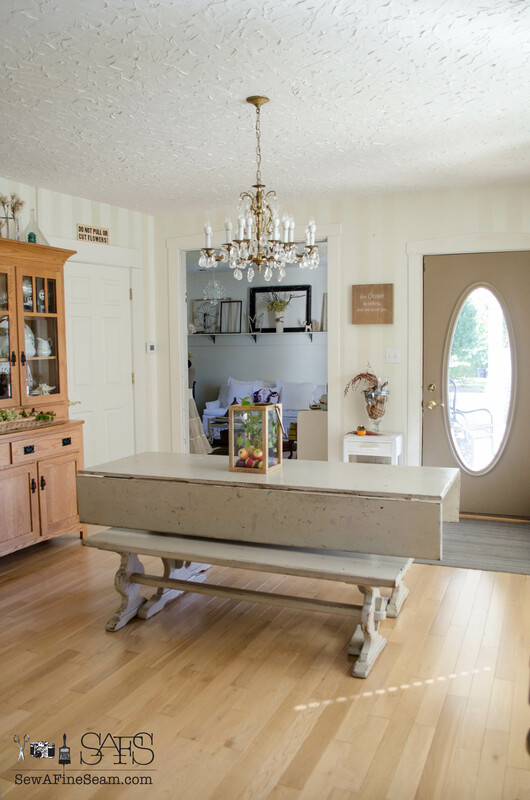 I love the wooden tool box, dining table, chandelier, piano, baskets oh and your Gathering sign….At this point I Should I say I love everything about your home. Thank you for letting us peek around! 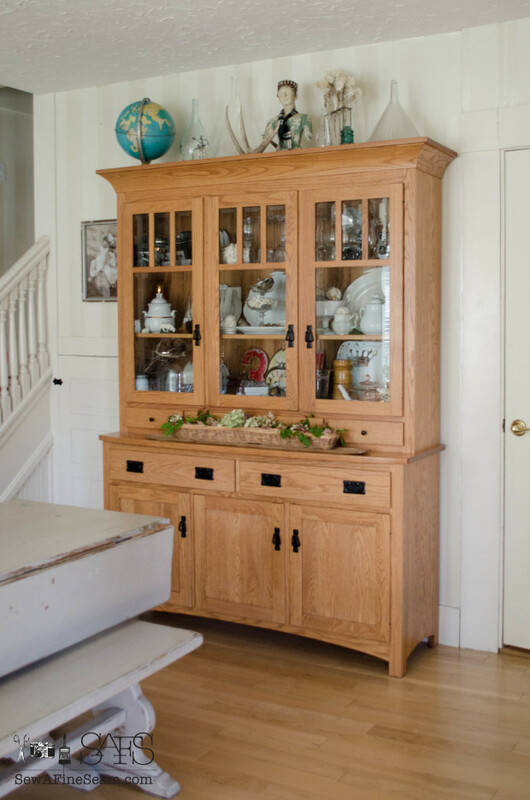 What a beautiful home tour, I love the gorgeous, chippy urns so much!! I love them too Tanya, I’ve had them for several years and love how they are weathering. My hubby said this Spring maybe we should paint them. If he mentions it again next Spring I’m going to go for clear coating them to protect them a bit. I LIKE the rusty chippy look they are sporting! Again, your creativity shines through. You have done a great job!!! The urns are my favorite. 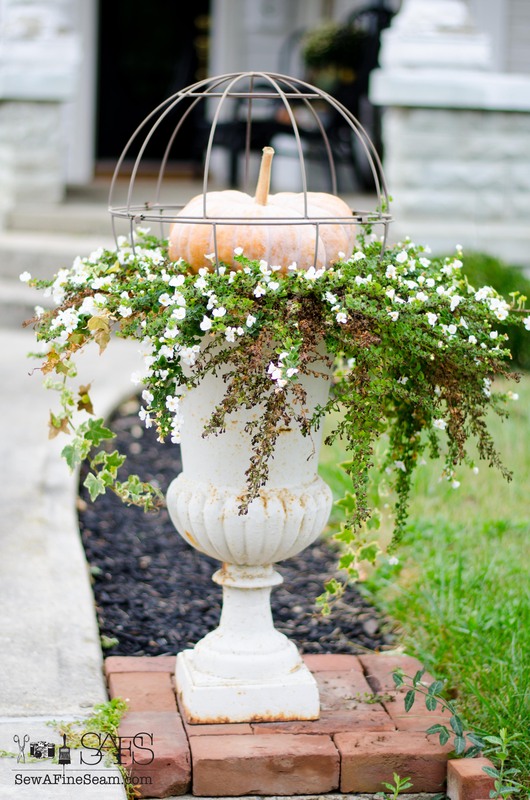 Thanks so much Donna Marie – I love the urns too and it’s so fun to change them up a bit for fall. Thanks so much Cathy, I love that chandi so much! And I love photographing vignettes and rooms and anything inanimate – haha! Lovely, Jill. How creative to use the cedar log slices. 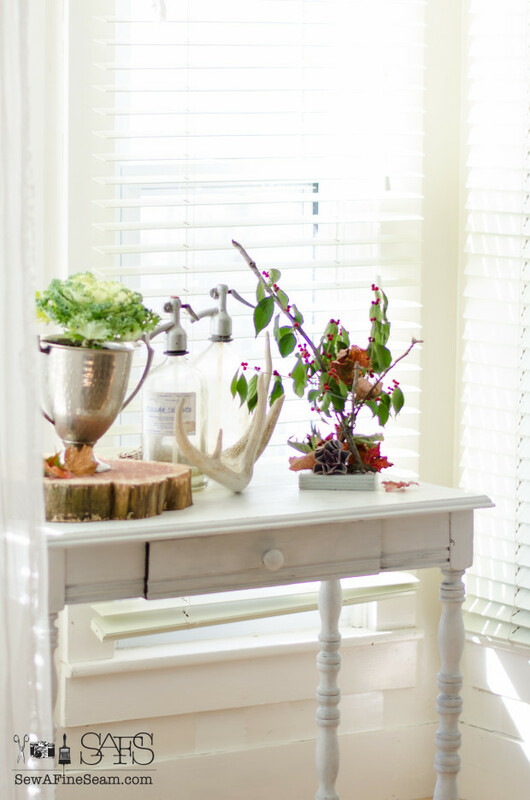 Your fall vignette in the house and on the porch are eye appealing and inviting. Love the new dining room chandelier. I too like lots of light, now more than ever since my vision is dimming more as I get older. I remember we had lots of Mums in Lake County. Those plants were the hardiest to have for Ohio’s freezing winter weather. We have them here too in Virginia but they don’t like our heat and bloom in September. We just suffered through over a week of rain and wind. Today is the first calm day we’ve had. I hope it’s not an omen of what is to come this winter. Thanks Michele, and thanks for putting this Home Tour Group together! Your home looks so pretty and inviting too! Thanks Alexandra! I had fun with this decorating! I love your fall home, Jill! 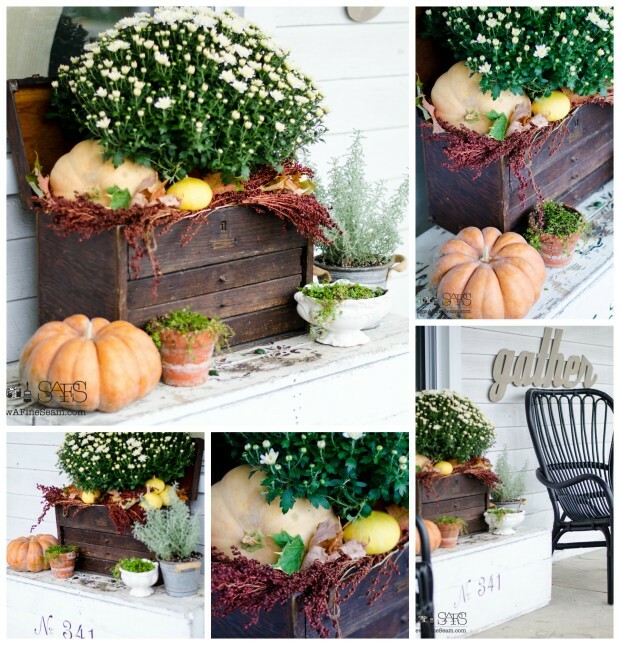 LOVE the old toolbox and the urns with the pumpkins! And you’re right – David looks splendid up on his wood-slice pedestal! Thanks for sharing!! Thanks Sondra 🙂 I love my wood slice pedestals so much! I have a couple more and I hope to create a fun fall centerpiece with them for another fall post! I love your home!! Such beautiful little touches everywhere! In also glad to have discovered you because I just bought a sewing machine for my girls and I and can’t wait to get ideas. Thanks Amy! If you have any sewing questions just ask and I’ll help all I can! Thanks so much Meegan, you are so sweet! I had fun spiffing the place up a bit! What a great tour! It’s beautiful and fun all at the same time. 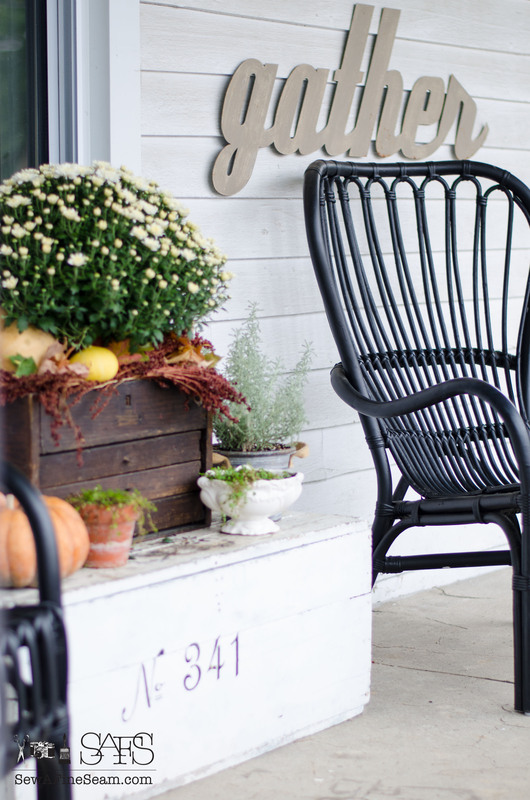 Lots of inspiration in this stop of the fall home tour! It is all so fun!! I’m trying not to covet the little pumpkin with the succulents! 😉 I really love all the dried blooms and leaves and natural stuff you used. So fun! 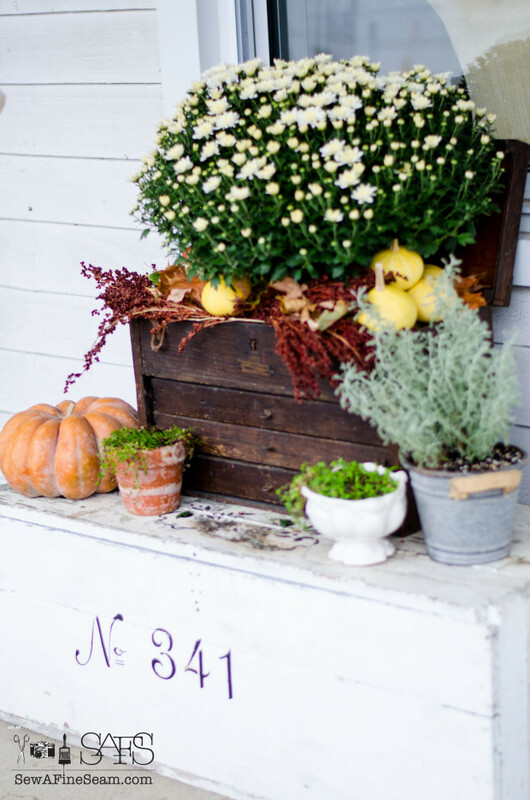 The flowers and pumpkins in your urns are just gorgeous! I love the leaves and berries and pool balls and I like the leaves and little broom in the corner shelf. It’s all so pretty. 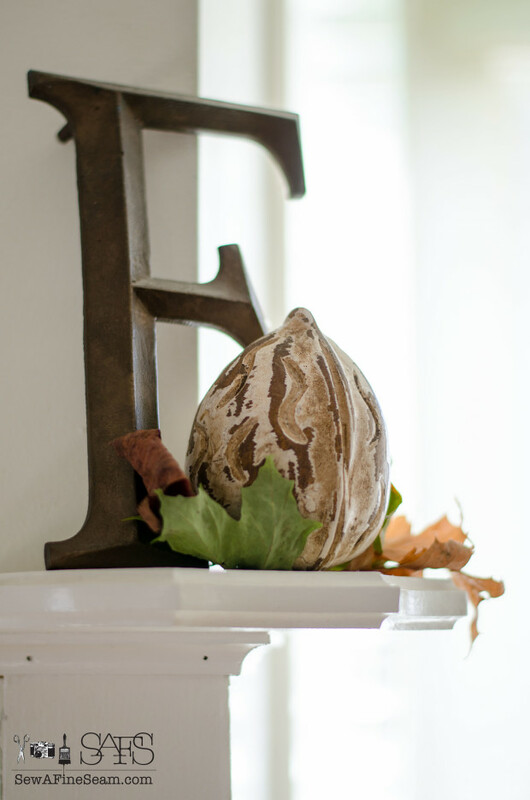 Fall decor is so much fun. 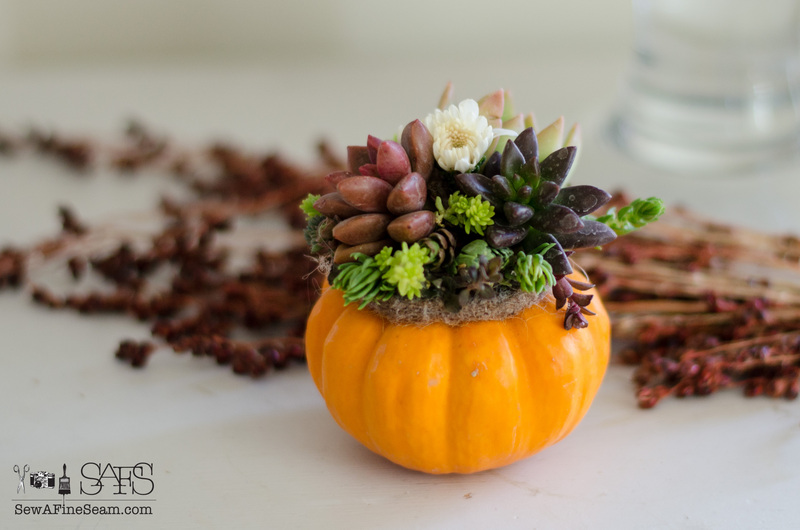 I bet you could find some succulents and little pumpkins and make your own little display! The succulents are just hot glued on and you could use pieces of larger succulents. I may try to raise enough succulents next spring/summer to make some of these myself next fall. Everything looks so great and crisp!! What kind of camera do you use? Thanks Kim. I use a Nikon d7100 and a 50mm lens. JILL!!!!!! I love your home! I can’t get enough of your fall touches. My favorite two are the outdoor topiary pumpkin flower arrangement and the berries with the pool balls. Omygosh just stunning. Pinned and shared. Thank you so much Stephanie, fall has been really fun this year! Great! Love everything. 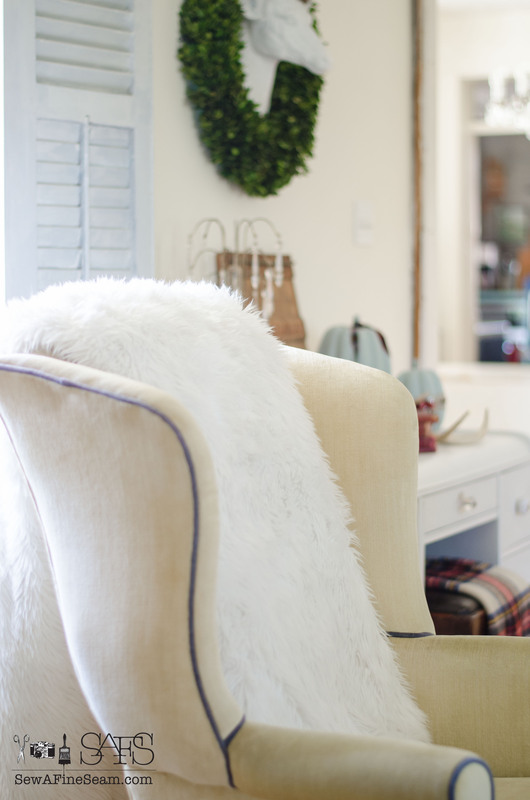 You are so unique in all you do and your home has never looked more beautiful! Love! 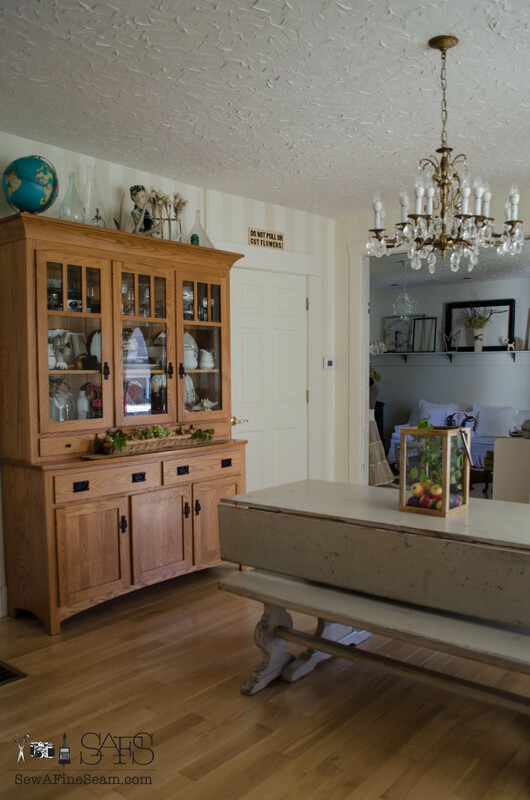 Thank you Jane, it makes me happy to look at my decor – even when stuff gets messy and cluttered with everyday life the decor is still there behind the scenes to make me smile! Love your decorating style Jill. Every one of the vignettes is fabulous. 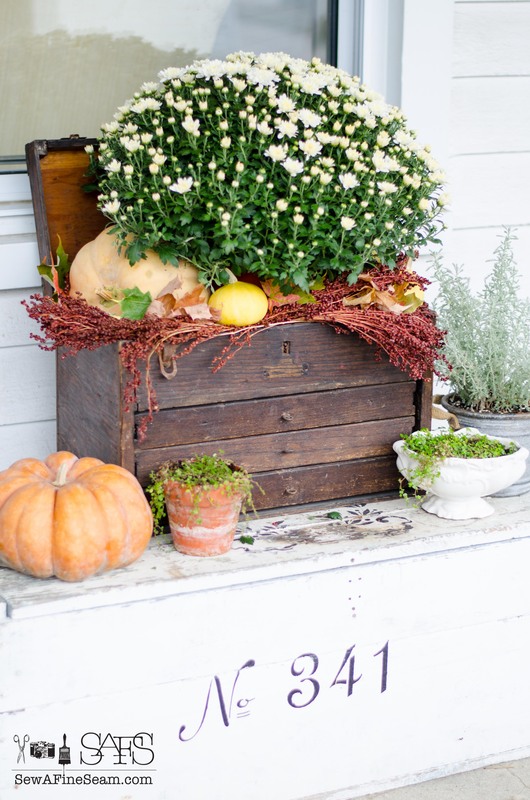 The mums and pumpkins in the tools box and the pumpkin in the planter are my favorites. Happy Fall! Thanks Vidya, I love the way it turned out this year! 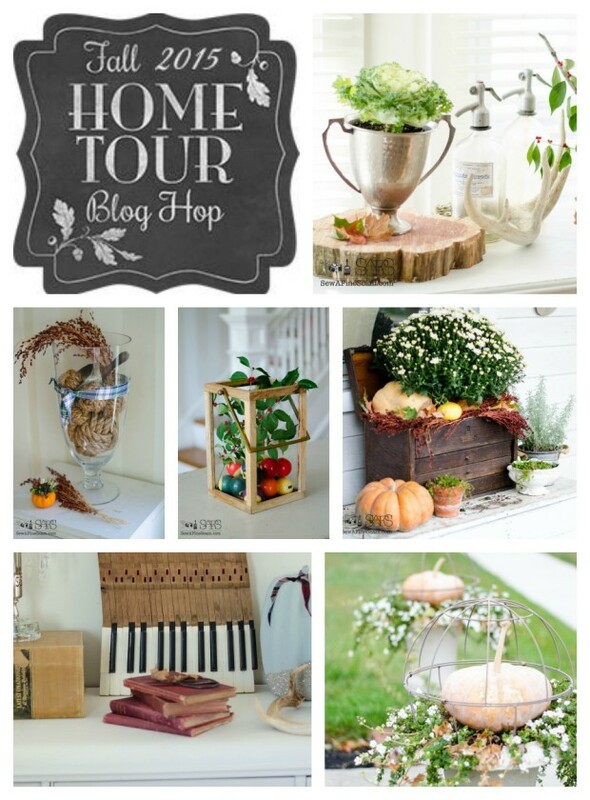 Oh Jill…I just want to throw my fall home tour in the garbage after looking at your wonderful photos! Everything is just dreamy! 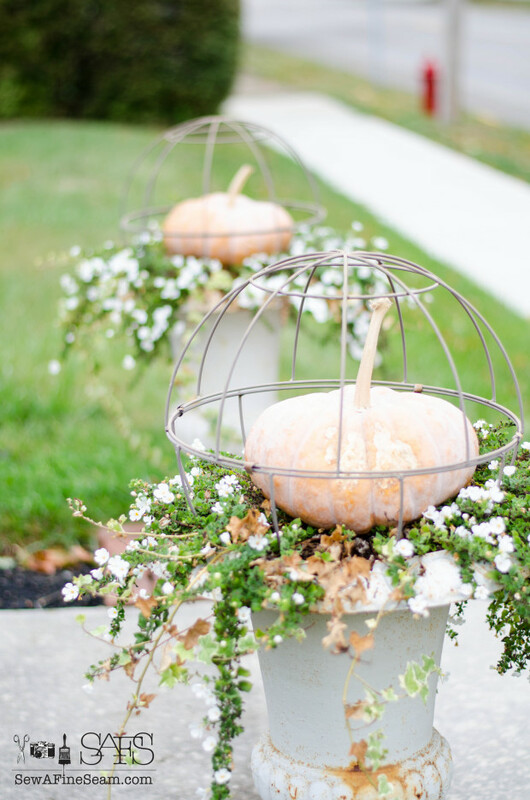 Love the urns with pumpkins and flowers and orbs…so fab! Love your porch arrangement and your new chandeleir is to die for!! Now now my friend don’t feel that way! I have felt that way myself before and can fell that way now about the rest of my house! 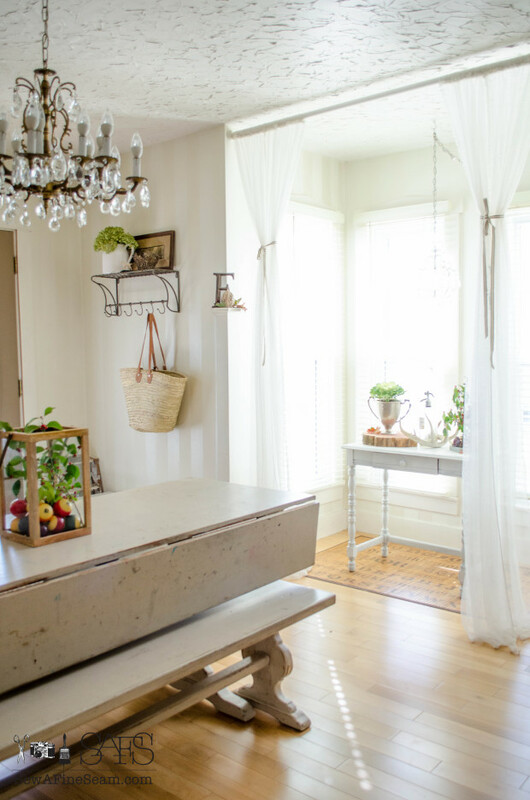 I didn’t show you my kitchen that is in desperate need of paint, my work room that you can hardly walk through, the places outside that are not pretty at all, and my bedroom – it’s the catchall for everything that doesn’t have a ‘home’. It’s horrible – really! So just share your space, and love the space you live in! It’s a process creating a lovely home you love to live in and you just moved! It’s going to take some time to get it just like you want it! p.s. 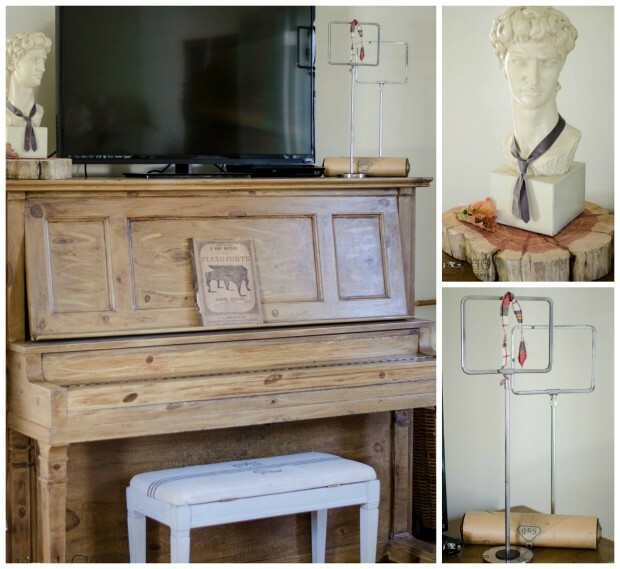 I am in love with your metal coat rack with the shelf! Do you mind sharing where it’s from with me? Lisa, that coat rack with the shelf was from Decor Steals – I’m sure they will offer it again sometime! 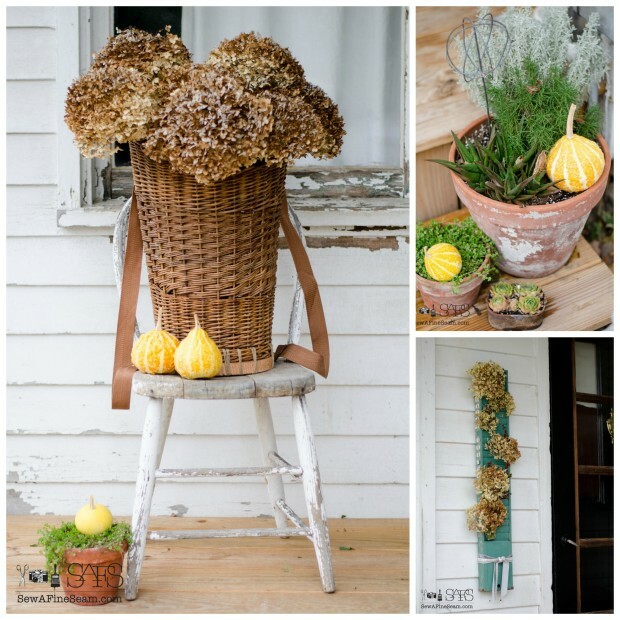 Thanks Andrea – easiest fall decor ever – just add pumpkins! Your house is soooo beautiful! I love the details in every place I look at! 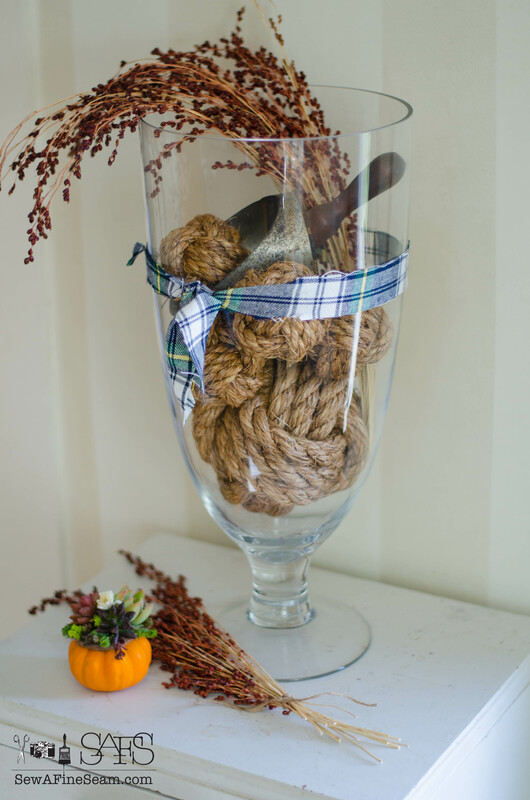 The vase with the ropes is really lovely.